Wanting to get away yesterday from the maddening crowds of the EU referendum debate, I took a Sunday afternoon break to the quintessentially English town of Marlow in Buckinghamshire. Flying proudly over the River Thames was the Union Jack, reminding me that I am indeed proud to be British. But all around this typical English town were the signs that Britain is also intrinsically linked with and part of Europe – our continent. Marlow is twinned with Marly-le-Roi in north-central France. Both towns decided on the link because of their similarities – they are both on a river, they both have rowing regattas, they are both near their capital cities, and the towns are similar sizes and have similar sounding names. They formally became ‘twin towns’ in the same year that Britain joined the European Economic Community (later to be called the European Union) in 1973. And the grand-looking Marlow Bridge crossing the River Thames is forever ‘bridged’ with its much larger but identical twin Széchenyi Chain Bridge crossing the River Danube in Budapest, Hungary. Both bridges were designed by the celebrated English civil engineer, William Tierney Clark in the 1800s. The Budapest bridge was also built in England and shipped in sections to Budapest. Budapest celebrates the building of the Chain Bridge every year on 17 June. It is indeed a bridge between Britain and Europe..
Eurosceptics often claim that they love Europe, but hate the European Union. They assert that Britain can still be part of Europe without having to be part of the European Union. That, of course, is true to an extent, but it rather misses the point and purpose of the EU. The European Economic Community – later to be called the European Union – was started in the immediate aftermath of the Second World War, with the express intent of avoiding wars on our continent ever happening again. So the EU was never just an economic agreement between nations. It was always also meant to be a social and political union of European nations to enable them to find ways not just to trade together, but to co-exist and co-operate in harmony and peace on many levels as a community of nations. “We must build a kind of United States of Europe. The structure of the United States of Europe, if well and truly built, will be such as to make the material strength of a single state less important..
“There is no reason for us not to succeed in achieving our goal and laying the foundation of a United Europe. In early 1957 the European Economic Community (EEC) was established by its six founding nations, France, Italy, West Germany, Belgium, The Netherlands and Luxembourg. In a speech four months later in July 1957 at Westminster’s Central Hall, Churchill welcomed the formation of the EEC by the six, provided that "the whole of free Europe will have access". Churchill added, "we genuinely wish to join". In August 1961, Churchill wrote to his constituency Chairman, "I think that the Government are right to apply to join the European Economic Community.." And just two years before he died, in 1963, Churchill wrote, "The future of Europe if Britain were to be excluded is black indeed." Maybe this is the point that many in the ‘Leave EU’ campaigns simply don’t get. Here in Britain we don’t seem to understand the founding principles of the European Union – and on the rest of the continent, they don’t understand why we don’t understand. The European Union isn't just about trade, and never was. It’s about peace, and a community of nations of our continent working together for the benefit and protection of its citizens. Although NATO protected us from external threats, the European Union has stopped us from going to war with each other. That’s a huge accomplishment for a continent that was previously more used to employing violence as the way to settle disagreements. Many Eurosceptics often claim that in the first referendum all those years ago, Britain was misled into thinking that the ‘Common Market’ was just a trade arrangement with the rest of Europe. But that’s not true. I was there. The discussion was dominated – especially by the NO campaign – about political union with Europe. So, when Britain threatens to walk away from the European Union, we are doing much more than a possible move away from ‘free trade’ with each other. We are snubbing our European allies and partners on something that they seem much more passionate about than us. We are telling them that we don’t want to be part of an exceptionally special and precious community that goes way beyond the considerations of trade and economics. 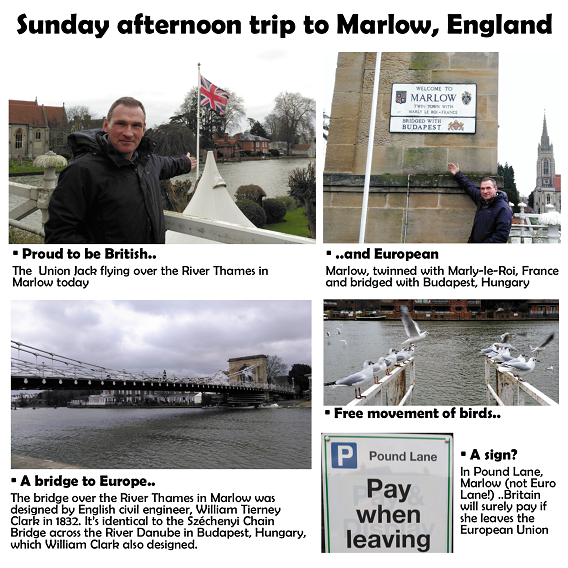 It would be the same as Marlow telling Marly-le-Roi that it no longer wanted to be twin towns. As I walked along the banks of the River Thames in Marlow yesterday afternoon, I saw migratory sea gulls flying back and forth. For sure, they enjoy free movement, just as the peoples of Europe – including Britons – enjoy free movement across our continent. Isn't that inestimable? Just as those birds would hate to have their wings clipped, wouldn't we too? To lose the right to live, work, study or retire anywhere on our continent would be a massive loss to our sense of freedom and comradeship across our continent. That right has only come about through our membership of the European Union. At the car park in Pound Lane, Marlow (note, not Euro Lane, Marlow!) was a notice warning to ‘Pay when leaving’. I wondered if it was a sign yesterday afternoon, on the first full-day of the four-month campaign ahead of us before the EU referendum vote. Wouldn't Britain also have to pay a huge price for leaving the European Union? We would be rebuffing our allies in Europe, telling them by actions if not words, that the post-war project to find peace and security on our continent isn't so important to us as it is to them. Would our friendship and relationship with the rest of our continent ever recover? Don't let down all of those who died in War, for its them who want us to live in peace.